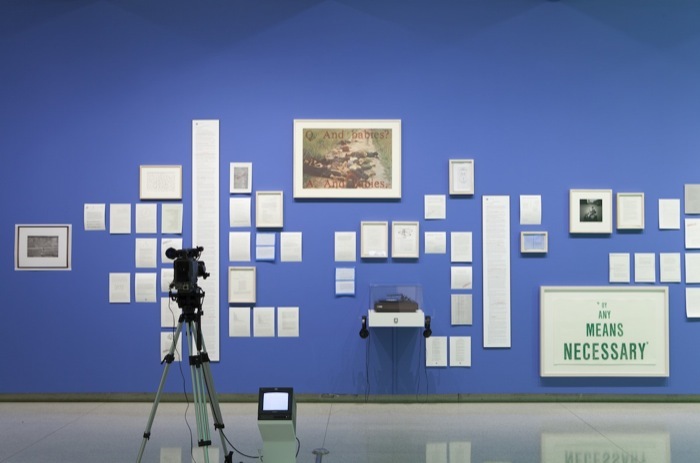 Karen Mirza and Brad Butler's multi-layered practice consists of filmmaking, drawing, installation, photography, performance, publishing and curating. Their work challenges terms such as participation, collaboration, the social turn and the traditional roles of the artist as producer and the audience as recipient. 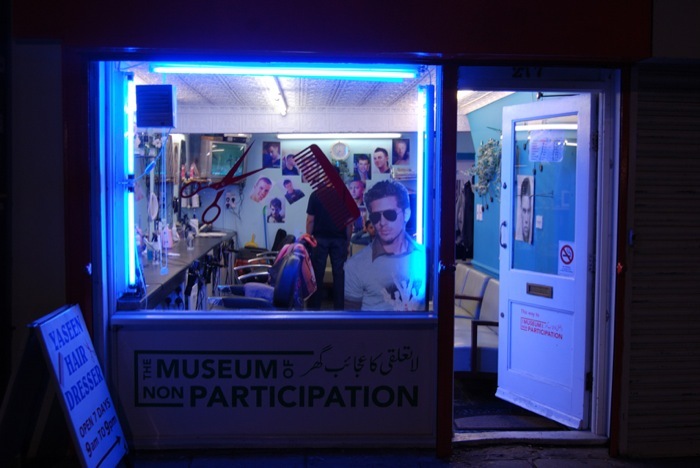 Since 2009, Mirza and Butler have been developing a body of work entitled The Museum of Non Participation. 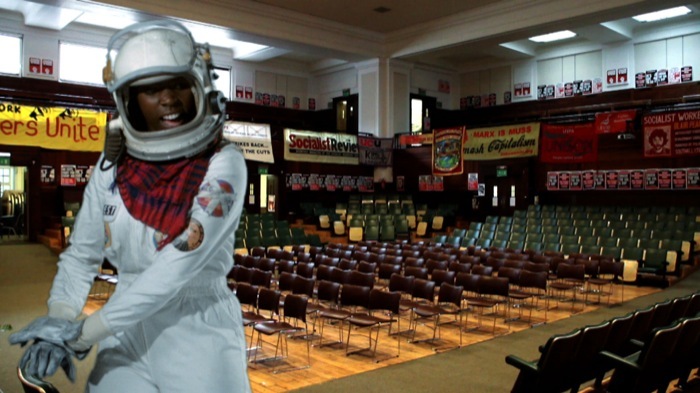 The artists have repeatedly found themselves embedded in pivotal moments of change, protest, non-alignment and debate. 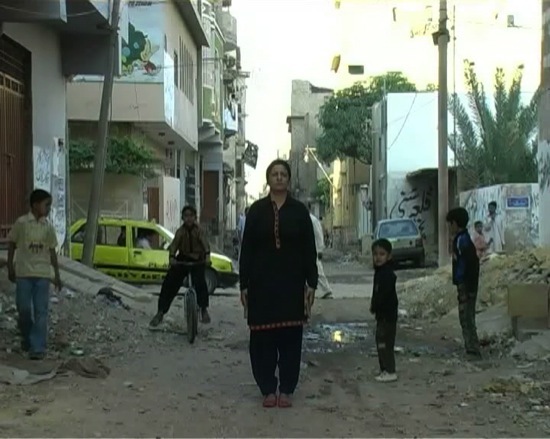 Experiencing such spaces of contestation both directly and through the network of art institutions, Mirza and Butler negotiate these influences in video, photography, text and action. Their recent solo presentations include Artrs Mundi 6, The New Deal at Walker Art Center, Minneapolis, and The Guest of Citation at Performa 13, New York. 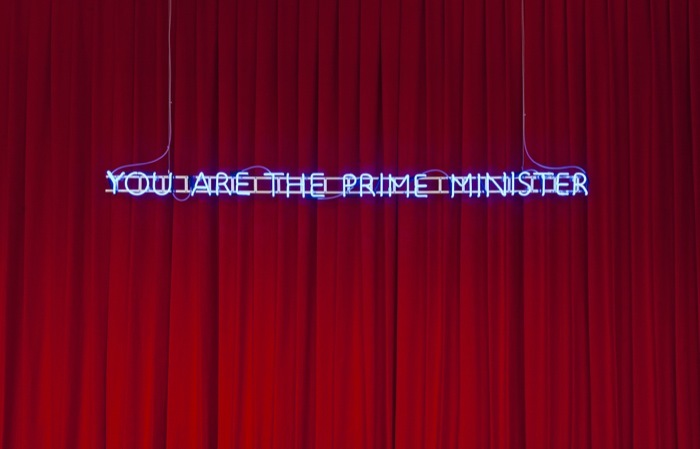 Mirza and Butler have exhibited internationally, including at Hayward Gallery, FACT, Liverpool, Centro de Arte Dos De Mayo, Madrid, La Capella, Barcelona, Arnolfini, Bristol, and Serpentine Gallery, London. They are recipients of the 2015 Paul Hamlyn Foundation Award for Artists. 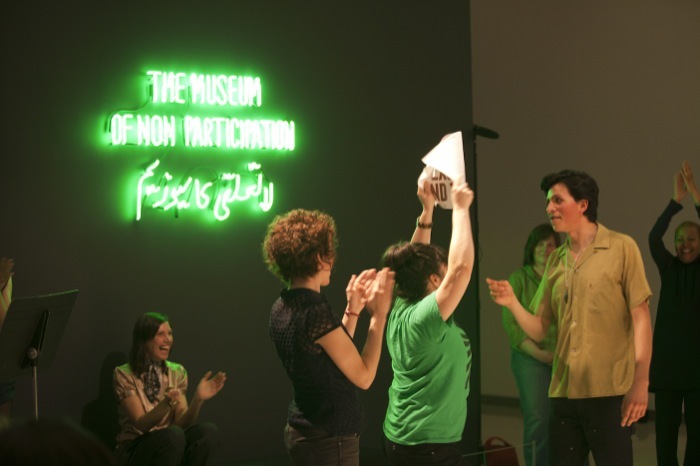 In the commission for Performa 13, Mirza and Butler invited local residents to work within the Museum of Non Participation to create and intervene in the Brechtian short ‘learning’ play, ‘The Exception and the Rule.’ The rule referred to in the title implies a legal language or a directive, while the exception evokes being ungovernable, or searching for an alternative to either the state or the free market. Together, they suggest that the rule cannot exist without the exception; the terms also pose a question as to what qualifies as a state of exception. Through the story of a merchant and his servant, ‘The Exception and the Rule’ explores themes of capital and petropolitics, labor and hierarchy, and legislation and state ideology. ‘Deep State’ is a film by Karen Mirza and Brad Butler that has been scripted in collaboration with author China Miéville. The film takes its title from the Turkish term ‘Derin Devlet’, meaning ‘state within the state’. Although its existence is impossible to verify, this shadowy nexus of special interests and covert relationships is the place where real power is said to reside, and where fundamental decisions are made – decisions that often run counter to the outward impression of democracy. 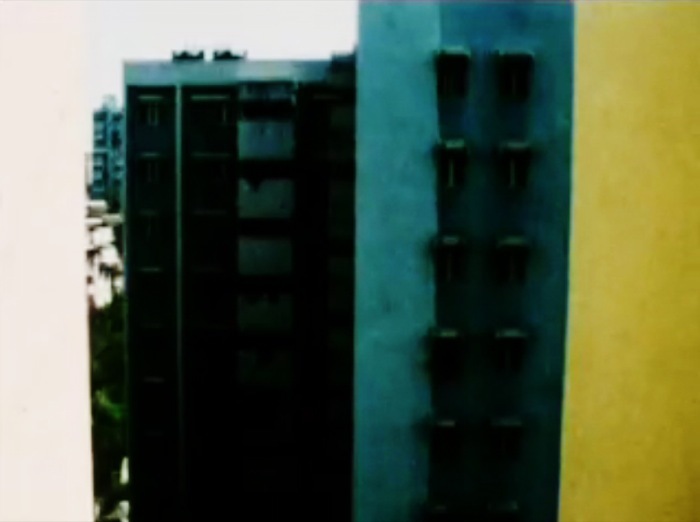 Hold Your Ground is a companion piece to a larger film work by Karen Mirza & Brad Butler, scripted in conjunction with the author China Miéville. 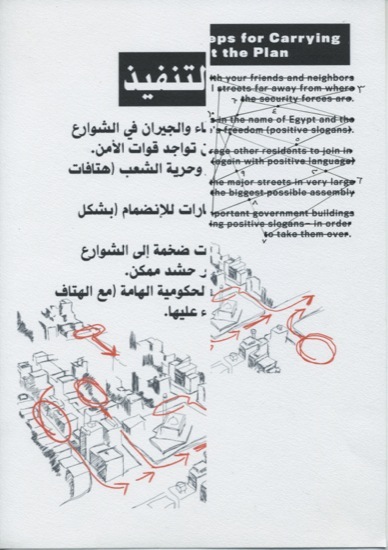 Inspired by the events of the Arab Spring, and triggered by the artists’ discovery in Cairo of a pamphlet of instructions for pro-democracy demonstrators, called ‘How to Protest Intelligently’, the piece dissects the ‘semantics’ of the crowd, and the resulting performative ‘speech act’. 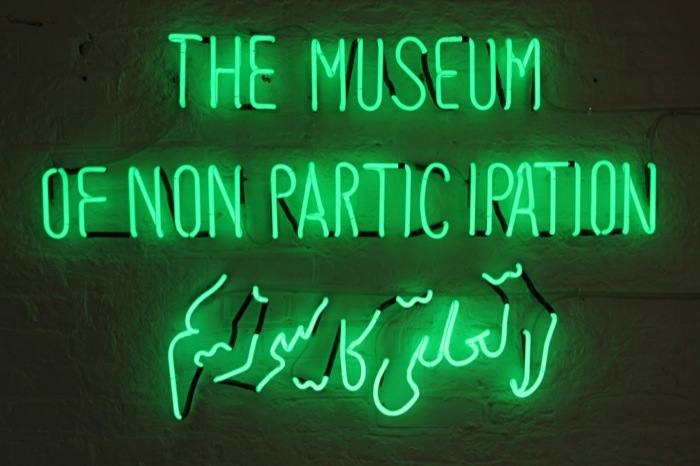 The neon sign acts both as a verb and a noun, a doing and a naming of the temporary and nomadic site of the Museum of Non Participation. Text becomes image, image text, text action to open a discursive space of the Non. The sign invokes a language of resistance that questions our paradoxical, contemporary condition of participation and withdrawal. 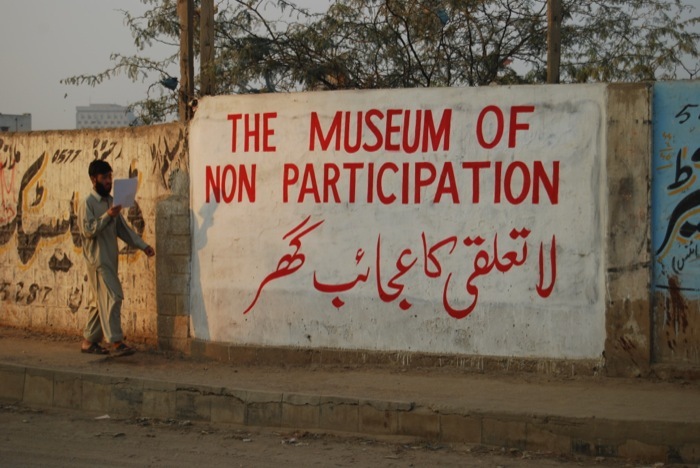 Its literal reading juxtaposes the Roman English and popular Urdu translation larta lucki ka ajib ghar, which when translated back into English reads: ”the museum of non participation, the house of the unexpected”. Thus hidden within both the language and the sign itself is praxis of intervention and disruption. 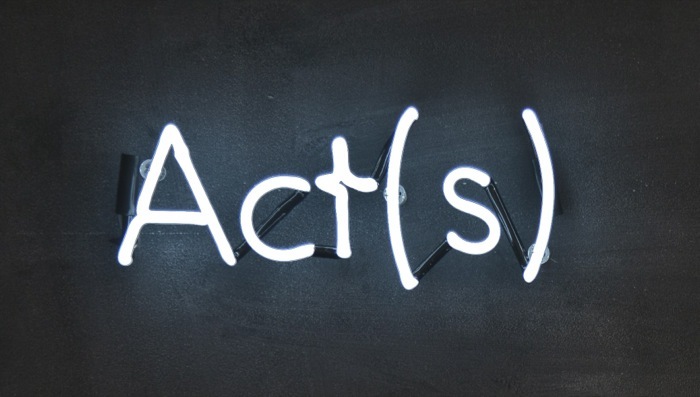 The blackboard ground on which the neon sign performs itself is a pedagogical tool in which the pamphlet The Aesthetics of Resistance rests. On Collections and Collectivity is presented as part of the Arnolfini's ‘Museum Show’ which across its two chapters presents museums by approximately 40 artists. The exhibition looks at the different interpretations of what a museum can be, whilst charting the methodologies and reasons used by artists for creating their own institutions - ranging historically from critique directed towards institutions of art, to more contemporary examples that focus their attention towards wider social and political realms of cultural hegemony. 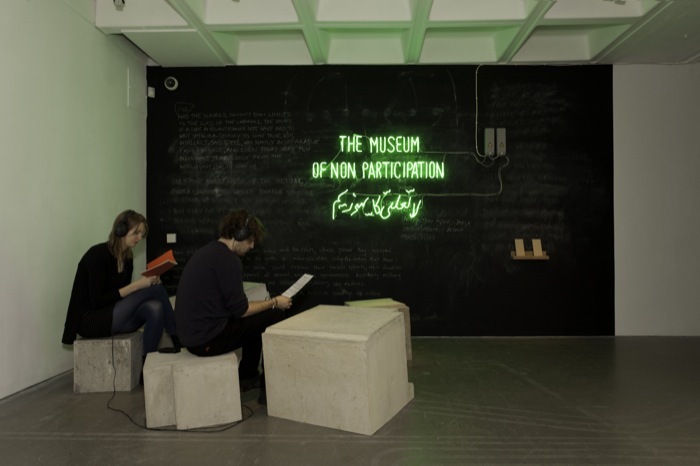 Here the Museum of Non Participation effaces the official exhibition catalogue for the Whitechapel’s 2011 exhibition At Work. 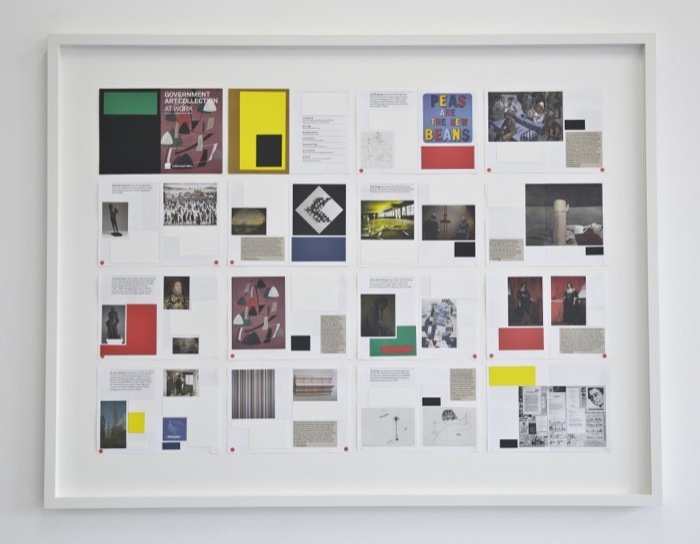 Covering up all information about the artworks and leaving only the commentary by the public figures intact, this act of concealment intervenes to reveal the complex conditions within, and precarity of power and labour, that surround and permeate, the arts. It foregrounds the social relations and apparatus behind the distribution, ownership and purchasing of works and state responsibility to art. Shown here in dialogue with a pamphlet protesting the Whitechapel exhibition, the double-paradox of economic laundering is ushered forth. What will the next revolution look like? 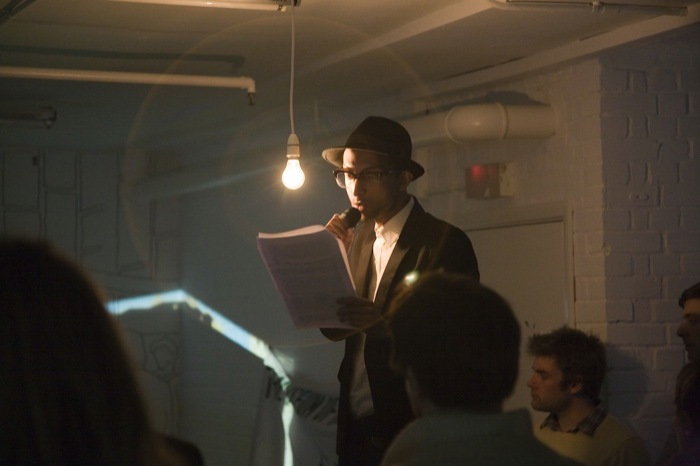 is a site conditioned performance lecture that leaves its presence as an installation. 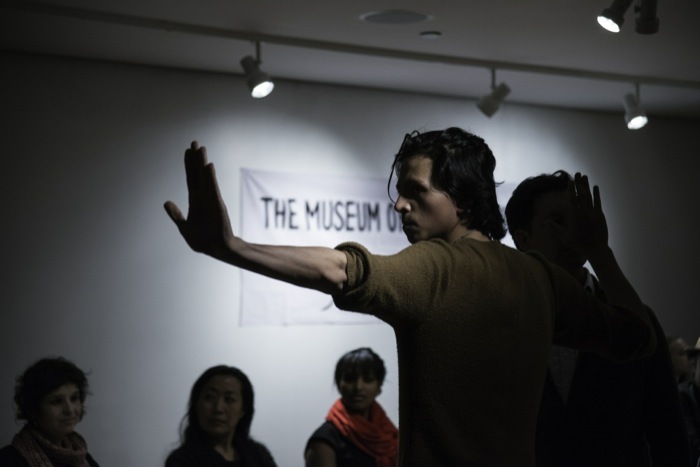 Through both recorded and performed texts each performance starts with the story as to how the Museum of Non Participation came into being to introduce a meta-narrative seeking to embody representational politics of this social and political experiment to define the boundaries of non-participation and resistance. Every morning in Karachi we read the local newspapers. This became a pattern. The front pages of the International and Local news told us how our day might go. In these troubled times news headlines had direct impact on our sense of freedom around the city. The distance we were prepared to go from home. Most articles were lucid, intelligent, balanced and current, but as the days and opinion cycled past so our interest in these articles waned. After all, even a cursory look at a map would raise an eyebrow as to the complexity of Pakistan’s neighbours. This is a country where so many [geo-]political points converge that their tides are directly played out in people’s everyday. The pace of daily change piled thoughts on top of one another. When we put this to a learned friend active in Pakistan he laughed and told us that: To understand Pakistan you must first understand that you cannot rationalise the non-rational. Mirza and Butler have collapsed over 35 performances with passerby’s set in India, Pakistan, New York and London into a boxed object. This object contains an invitation to interpret the work in response to: the changing site of each exhibition | the perceived thinking behind the work | and the screens, surfaces and props in each performance. 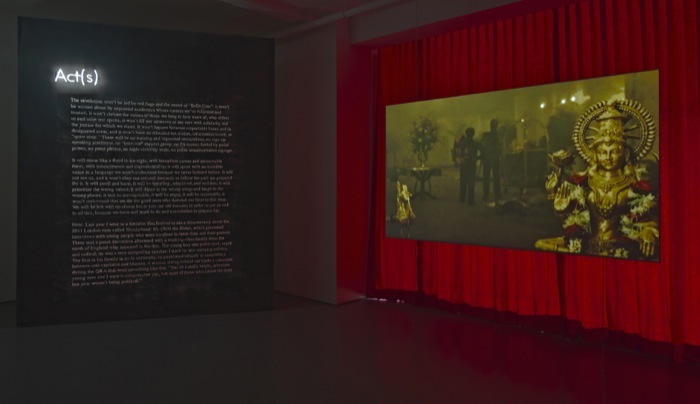 Each film performance returns to the Modernist concerns within ‘Mirror Film’ by Robert Morris (1969) viewed through postmodern concerns that problematise the location of the performance and the issue of authorship. 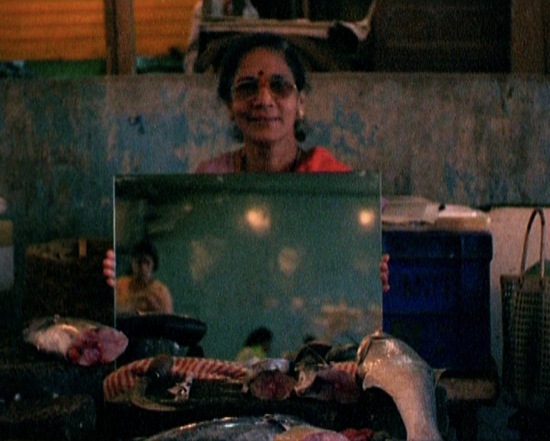 Perceiving both anthropology and art from this direction Mirza and Butler are suggesting new ways of positioning structural film within revisionist anthropology. This playfully questions whether the camera and or/ its subject matter is acting as the agent, mediator and/or the performer as articulated within the language of contemporary art. The Space Between is an open structure based on a relatively small set of input materials. The live sound (generated from a single electric guitar) uses a series of simultaneous delays to create spatially separated long repeating loops and very short delays. The harmonic input is restricted - all complexity arises from the overlapping delays, a parallel structure which mirrors or coexists with the multiple time bases of the repeating film loops and the multi-screen edit/flicker.